Florida offers an abundance of warm golf destinations. Amongst the many cities blessed with great golf is Lecanto. It is there where you will find Black Diamond Ranch. Don’t let the name intimidate you. 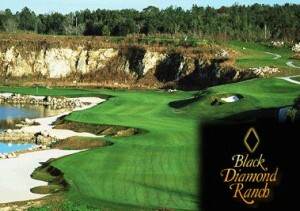 Black Diamond Ranch is a golf sanctuary with five star golf at three star pricing. Forty five holes from one of golf’s most revered course architects, astonishing views and the promise of teeing it up in shorts year-around. On the surface, it’s easy to see why so many Wisconsin golfers in search of a second or retirement home end up at Florida’s Black Diamond Ranch. But, for all of the community’s virtues, a large part of what beckons golfers down I-75 is what Black Diamond Ranch doesn’t have. Traditional golf hotspots like Orlando and Miami are big cities with traffic and overcrowding. Black Diamond Ranch’s location in bucolic Citrus County (1.5 hours north of Tampa and west of Orlando) leaves it devoid of big city problems and fosters a quality of life commensurate with its trinity of Tom Fazio golf courses. 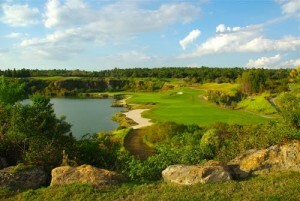 Black Diamond Ranch’s crown jewel, The Quarry, is known as one of the most stunning settings in the U.S. In 1987, Fazio collaborated with Mother Nature to pull off one of the great golf design feats in history. By forging the course through the steep cliffs and lakes of two retired limestone quarries, he created scenery that can only be described as other worldly. The Quarry’s front nine features dramatic elevation changes, classic bunkering, and fairways framed with thousands of beautiful live oaks. 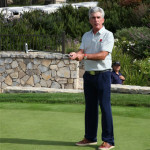 Shortly after making the turn, Fazio delivers what famed golf writer Dan Jenkins called “the five best consecutive holes in the world.” The stretch begins at No. 13 and concludes with the 218-yard par-3 17th. Completed in 1997, The Ranch Course was carefully crafted to gently blend into its natural surroundings. Reminiscent of Pine Valley, The Ranch sports rolling fairways and dramatic elevation changes of more than 100 feet. The Ranch places a premium on strategy and distance control. 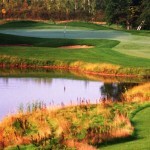 Sand traps, waste bunkers, pristine lakes and numerous two-tiered greens serve as par’s guardian. With stunning hilltop views of up to 25 miles, The Highlands Course, which was completed in 1997, is a magnificent mix of lush, rippling fairways, stands of oak and pine, pristine water features and mesmerizing natural beauty. From the back tees, the nine-hole, par-36 course plays to almost 3,500 yards and has an impressive slope rating of 143. The Highlands can also be played in tandem with either nines of The Ranch. Combine the serene lifestyle with its bountiful golf offerings and it’s easy to see why so many Northerners have helped make Black Diamond Ranch Florida’s No. 1 golf community. Visit them online or give htem a call.